In their youth: yellow-gold, subtly oaky, and creamy-textured, rich yet dry and intensely citrusy, with honeyed nuances. Wholly unique, the style has been described as resembling ‘dry Sauternes’ or mature white Graves. Chateau Musar Whites develop tawny hues and mellow spicy characters as they age. The cellars at Ghazir holds bottles of this wine dating as far back as 1954. 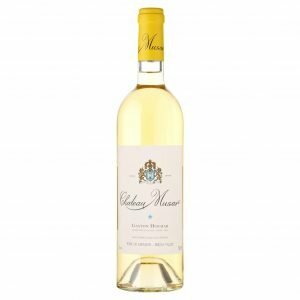 Seven years in the making, Chateau Musar White is a blend of ancient grape varieties Obaideh and Merwah, indigenous to the mountains of Lebanon and said to be related to Chasselas Chardonnay and Semillon. The Obaideh vineyards are in the foothills of the Anti-Lebanon mountains on stony, chalky soils, while the Merwah vines are on the seaward side of Mount Lebanon, on calcareous gravels. Yields are very low for these untrained bushvines: 10 – 20 hl per hectare. At high altitude (around 1400m) they are still on their own roots, among very few vineyards in the world of this calibre. “Musar’s whites and rosés are less well-known. More’s the pity: both are unusual and superb.” – ANDREW JEFFORD, ‘DECANTER’, JANUARY 2004.